John 21:18-22 just keeps coming back to me. Jesus tells Peter, in no uncertain terms, that he shouldn’t worry about John or what the Lord has in store for him – that’s the Lord’s business. Peter’s business, if you will, is to follow Jesus and be faithful to Him. 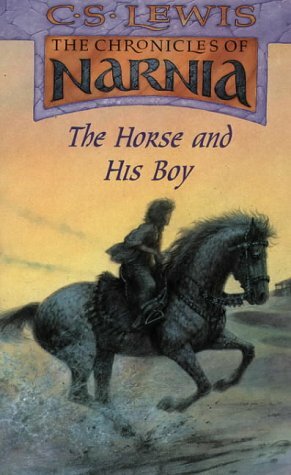 I ran across this theme again as I finished “The Horse and His Boy” by C.S. Lewis. Aslan explains to the boy Shasta how he has worked in his life – the lion who forced him to join with the girl Aravis, the cat who comforted him among the houses of the dead, the lion who drove the jackals away from him as he slept, the lion who gave the horses (Bree and Hwin) the strength to go the last mile, and more. There it is again! Don’t worry about what the Lord is doing with someone else, just follow Him and be faithful to Him yourself. I’ve been reminded of that idea numerous times in the last several years. It must be important! “For this reason I also suffer these things, but I am not ashamed; for I know whom I have believed and am convinced that He is able to guard what I have entrusted to Him until that day” (2 Tim. 1:12). What did Paul entrust, or give to the Lord for safe-keeping? He entrusted his desires, his plans, his talents, his abilities, his ministry, his life, his past, his present, and his future. In short, Paul entrusted everything to the Triune God – the One he believed in and the One he was convinced could (and would) guard him and keep him, no matter what he might suffer. It’s no different for you and me, either. We entrust everything to Him. May we be convinced that He can guard it (and us). Here’s an update on Steven Curtis Chapman and his family following the death of his five-year old daughter. Please keep praying for Steven, Mary Beth, and their children. You can read the update here. Acknowledge that everything we have comes from God. Psalm 24:1 says, The earth is the LORD’s and the fulness thereof, the world and those who dwell therein. The apostle Paul wrote in 1 Timothy 6:7, for we brought nothing into the world, and we cannot take anything out of the world. 1 Corinthians 4:7, also written by Paul, says, What do you have that you did not receive (from God)? If then you received it, why do you boast as if you did not receive it? Visit and minister to those who have less. Short-term mission trips are an excellent way to accomplish this up close and personal. Of all the people I know who have went on these trips, none of them has come back unchanged. They’ve all been struck by how much they have compared to people in other parts of the world. They’ve also realized the world is a whole lot bigger than themselves. As a result, they’re more grateful. Avoid grumbling like the plague. It’s deadly – believe me, I know. Do all things without grumbling or complaining, says Philippians 2:14. We’re exhorted in 1 Corinthians 10:10 not to grumble. Express thanks frequently to God. Give thanks in all circumstances; for this is the will fo God in Christ Jesus for you (1 Thessalonians 5:18). The Lord has blessed us tremendously, so we should never run short of items for thanksgiving. Thank Him for the foods you enjoy, the friends you have, and the abilities you have. Be grateful for the fact that if you have one copy of the Bible, you have one more than one-third of the people in the world. Live a joyful life. Joy is one of the fruit of the Spirit in Glaatians 5:22-23. Christians are to be characterized by joy which comes from gratitude and helps develop it, as well. You and I can increase our gratitude, but only through the power of God the Holy Spirit. Guilty sinner, graciously saved, forever grateful. Could you write a story in only six words? Larry Smith founded started an online magazine – “SMITH” – where anyone can contribute a six-word story. It could be the story of your life, but it doesn’t have to be. You can find it here. Smith has put a number of these stories together in a book called, “Not Quite What I Was Planning,” which sounds like a good six-word story. What would yours be? I’m not sure what mine would be, yet – still thinking. Here, God gives His image-bearers the command to take dominion. Some have called this “the cultural mandate.” The theme is continued when the LORD God took the man and put him in the Garden of Eden to work it and take care of it. Taking dominion, then, means to “tend your garden,” to take care of what God has given you, to make it better and improve, and to bring it under submission. Karen was “tending the garden” which is our front yard. She is bringing it under submission and ruling it, and it’s been noticed. Tending our garden doesn’t apply only to our yard, but also to our life. Dominion extends to every area of life because Jesus Christ is Lord of all of life. Nothing is excluded. We should tend the garden of our finances, our bodies (meaning how we eat and how much exercise we get), our families, our relationships, and our work. The list goes on and on – anything we can think of. If you’re a student, you can tend the garden of your homework and keeping your room clean. If you’re like me, you can tend the garden of your study by keeping it orderly and clean (which would involve a lot of subduing!). If you’re married, you absolutely must tend the garden of your spouse and marriage. Fathers and mothers must tend the garden of their children. We all should tend the garden which is our church. Out task is to take care of whatever God has given us wherever He has put us. By and large, I think this is what it means to take dominion, rule over, and subdue His creation as His image-bearers. It’s not real flashy, just day-to-day stuff, but it’s what God calls us to.